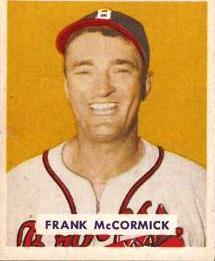 In three different seasons -- 1939, 1941, and 1944 -- Frank McCormick hit home runs more often than he struck out. In his entire 13-year career, encompassing 5,723 at-bats and more than 6,200 plate appearances, the slugging first baseman had just 189 strikeouts -- 10 fewer whiffs than Ryan Howard achieved in only 529 at-bats during 2007 alone. Only nine players in 20th century major-league history struck out at a lower rate, but McCormick did far more than just make contact. He was also a .299 lifetime hitter, a terrific fielder, and a nine-time All-Star who played on three National League championship teams. Frank Andrew McCormick -- nicknamed “Buck” for Frank Buck, a big-game hunter and movie director -- was born in New York City on June 9, 1911, to Andrew (a railroad worker) and Ann McCormick.1 He played the outfield in sandlot, church league, and high school baseball, and by the age of 17 had decided to become a professional ballplayer. After failing to impress at tryouts with the Philadelphia Athletics, Washington Senators, and New York Giants, McCormick borrowed $50 from his uncle and traveled to Beckley, West Virginia, for a tryout with the Cincinnati Reds in 1934. His sandlot manager suggested that there would be more competition for outfield positions than for first base, so McCormick became a first baseman. This time, he impressed veteran major-leaguer and Cincinnati scout Bobby Wallace and upon signing was sent to Beckley in the Class C Middle Atlantic League. He wasted no time in making an impression; he hit .347 in 120 games during his first professional season, and was brought up to the major-league Reds at the end of the ’34 season.2 He was 23 years old. McCormick’s big-league debut came against knuckleballer Dutch Leonard on September 11, 1934, at Ebbets Field in Brooklyn. He reached first on an error by the second baseman, not a very exciting start. A few days later, however, he got two hits against Hall of Famer Carl Hubbell at the same Polo Grounds where he had failed in a tryout years before.3 Though he hit. 313 in his brief stay with the Reds, he was sent back to the minors in 1935 and it would be three years before he returned for good. In 1935, McCormick covered some ground, playing for five different teams in five different leagues. He began with Toronto, hitting just .235 in 12 games before being sent to Fort Worth in the Texas League. After just five games playing for the Panthers (hitting just .100), Bill Terry of the Giants worked a deal that sent McCormick to Nashville, though the Reds still controlled his contract. He hit .311 for the Vols, but nonetheless saw duty in Dayton and Decatur before the year was done. In 1936, McCormick struggled badly during his first few games with the Durham Bulls of the Class B Piedmont League until manager Johnny Gooch suggested a different grip on his bat; he hit for an average over .400 for 12 straight weeks, finishing the season with a league-best .381. Frank opened the 1937 season with the Reds, but they couldn’t find a regular position for him. He played some at second base and one game in the outfield, but when a clear need for a first baseman at their Double A club in Syracuse opened up in mid-May, he was sent there for the rest of the year, hitting .322. He rejoined the Reds on September 19, banging out seven hits his first day back. He finished the season with an average of .325 in 83 at-bats. After coming up to the big leagues to stay in 1938, McCormick quickly showed that his strong early performances were no fluke. At 6 feet 4 inches and more than 200 pounds, he was much bigger than the average player of his day, and was a bigger hitter as well. He batted .327 to place third in the National League, led the league in hits with 209 -- the first of three consecutive years in which he paced the senior circuit in this category -- and drove in 106 runs. His production was all the more remarkable considering he had just five home runs. While McCormick’s defense remained stellar, his offensive production slipped in Philadelphia. Early in the 1947 season, hitting just .225, he was released by the Phillies and signed with the Boston Braves. Platooning at first with Earl Torgeson and pinch-hitting, he hit .354 with the Braves. McCormick and Torgeson were as diverse a pairing as can be imagined. Torgeson was a left-handed hitting rookie with a modest batting average but a high on-base percentage, because he drew many walks. McCormick was a right-handed hitting veteran who compiled high batting averages but walked infrequently. Their excellent output -- they combined to bat well over .300 with 121 RBIs -- was perhaps the best example of manager Billy Southworth’s widespread (and usually effective) use of platooning. McCormick hit .250 for the Braves as a pinch-hitter and part-time sub for Torgeson during their pennant-winning year of 1948, and ended his major league career on a high note with his third appearance in a World Series. His last hit was one of only five against Cleveland’s Gene Bearden, who shut out the Braves in Game Three. His last at-bat came three days later at Braves Field when he pinch-hit against Bob Lemon in the seventh inning of the sixth and final game. He grounded out to Ken Keltner at third, and the Braves lost the game and the Series, 4-3. A few weeks later, the Braves released the 37-year-old McCormick. In 1,534 major league games, McCormick batted .299, with 1,711 hits, 128 home runs, 951 RBIs, and a .995 fielding percentage -- the highest of any first baseman in history at that time, and still one of the top 10. Four more hits would have made him a career .300 hitter. During his eight full seasons with the Reds, he led the team in RBIs seven times, in batting average six times, in slugging average five times, in home runs four times, and in on-base percentage twice. His single-season totals for hits (in 1938 and 1939), doubles (in 1940), and RBIs (in 1939 and 1940) still rank among the top 10 in Reds history. McCormick stayed in the game after his playing days. In 1949 he managed the Quebec Braves in the Canadian-American League, and led them to a 90-win season -- 34 more than the previous year -- and to a playoff sweep and the league championship.14 Nevertheless, he found himself managing the Lima Phillies (Ohio-Indiana League) in 1950. That was his last stint as a manager, but he continued to be involved with baseball as a coach, scout, and television broadcaster for the Reds and as director of group and season ticket sales for the New York Yankees. He died of cancer in Manhasset, New York, on November 21, 1982. 1. Albert J. Figone, “McCormick, Frank Andrew ‘Buck,’” in David L. Porter (ed. ), Biographical Dictionary of American Sports: Baseball. (Westport, Conn.: Greenwood Press, 1987), pp. 348-349. 2. Honig, Donald, Baseball When the Grass Was Real. (New York: Coward, McCann and Geoghegan, 1975), Berkley Medallion Edition), pp. 221-226. 6. Werber, Bill, and Paul Rogers III, Memories of a Ballplayer. (Cleveland: Society for American Baseball Research, 2001), pp. 165-168. 9. Richard Wittingham (ed. ), The DiMaggio Albums. Vol. 1. (New York: Putnam, 1989), p. 251. 10. James, Bill, John Dewan, Neil Munro, and Don Zminda (eds. ), STATS, Inc. All-Time Baseball Sourcebook. First Edition. (Skokie, Ill.:, STATS, Inc., 1998), p.2469. 11. James, Bill, The New Bill James Historical Baseball Abstract. (New York: The Free Press, 2001), p.452. 12. “Frank McCormick,” Baseball Reference.com. 13. The New Bill James Historical Baseball Abstract, p.452. 14. Daniel Papillon, “The Quebec Braves: A Baseball Dynasty,” in Jane Dorward Finan (ed. ), Dominionball (Cleveland: Society for American Baseball Research, 2005), p. 114. Albert J. Figone, “McCormick, Frank Andrew ‘Buck,’ “ in David L. Porter (ed. ), Biographical Dictionary of American Sports: Baseball. (Westport, Conn.: Greenwood Press, 1987). Honig, Donald, Baseball When the Grass Was Real. (New York: Coward, McCann and Geoghegan, 1975). James, Bill, John Dewan, Neil Munro, and Don Zminda (eds. ), Stats Inc. All-Time Baseball Sourcebook. (Skokie, Ill., Stats, Inc., l998). _________, Stats Inc. All-Time Major League Handbook. (Skokie, Ill.: Stats, Inc., 1998). _________, The New Bill James Historical Baseball Abstract. (New York: The Free Press, 2001). Mulligan, Brian, The 1940 Cincinnati Reds. (Jefferson, N.C.: McFarland, 2005). Daniel Papillon, “The Quebec Braves a Baseball Dynasty,” in Jane Finnan Dorward (ed. ), Dominionball. (Cleveland: Society for American Baseball Research, 2005), pp. 114-117. Thorn, John, and Pete Palmer (eds. ), Total Baseball. (New York: HarperCollins, 1989). Werber, Bill, and Paul Rogers III, Memories of a Ballplayer. (Cleveland: Society for American Baseball Research, 2001). Whittingham, Richard (ed. ), The DiMaggio Albums, Vol. 1. (New York: Putnam, 1989).